Here are some clever alternatives to the traditional wedding guest book. Give your guests an opportunity to do more than sign their name in a book that will rarely be looked at. New and exciting trends are always popping up in today’s weddings: we’re seeing gorgeous veils, adorned with lace, pearls, or delicate embroidery, more brides are incorporating jewels and brooches into their bouquets, and beloved pets are taking part in the celebration as well. With all the great innovations that creative couples are making to their wedding days, why keep the same old, traditional, and, we’ll just say it, boring guest books? Reinventing your wedding reception supplies and specifically your wedding guest book is a great way to add more of your own personality to the wedding. Instead of the same old white book, try these great alternatives! Frame it for instant wall art! Find a large, wide mat that will hold a photo of the happy couple on your wedding day. 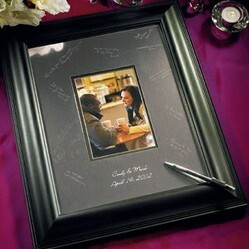 Guests will sign this, and later you can place a picture inside and frame it. This makes a fun, usable memento for your home. Along this theme, you can find a large, blank canvas for your guests to sign. After the wedding, it becomes a treasured piece of art and reminder of your big day. Find even more wedding reception supplies at Wedding Favors Unlimited! Big thanks to them for letting me use many of their images for this Wizzle! Guests can leave a special note! The lovely wishing well shown to the right is a Wedding Star product that looks like three-stacked books when the lid is closed. The idea is to have guests write their well wishes on beautiful paper cards that they can place inside the "wishing well" container. A baroque card can be used to convey your instructions to guests. And be sure to buy a lovely wedding pen set so that all of your guests have something to write with. Station a helper at the door of your reception area with a Polaroid camera or just put the camera and some instructions at the entrance if you are confident in your guest's enthusiasm. He or she can snap a photo of each guest or group of guests and then have them sign the picture and add a personal sentiment. These photos can be incorporated into a classic wedding album very easily. Online you can find special Polaroid photo albums that are designed specifically to serve as wedding guest books for the creative couple. Just do a quick search at Google or Bing to find some more ideas. Alternatively, you can string up some yarn, fabric, or other wired item on the wall so that the guests can hang up their photos on the wire after they've signed and left a message on them. That way, all of the guests can see each others photos easily. 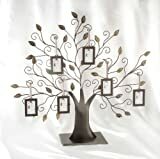 Some creative couples are utilizing wishing trees as a substitute for the traditional guest book. Wishing trees are a Dutch tradition in which guests write a wish for the couple on a paper leaf (or card) and hang it from the branches. Simply hang ribbon from the branches and buy some small pre-punched square favor cards that have plenty of room for guests to write their well wishes. They can then just hang their card from the ribbon when they are done signing it. Similar to the wedding signature mat idea, couples can find a framed piece of canvas art where guests can sign their names with a permanent pen. You can find special prints like the love birds version shown to the right that are personalized and have a unique wedding saying along with the love bird motif. Best of all, the couple will have a unique piece of art to display in their home after the wedding. First of all, you'll need to find a beautiful birdcage to use as the container for this creative wedding guest book alternative (image courtesy of Wedding Favors Unlimited). Then, you'll need to purchase wishing note cards from a wedding retailer or you can create your own 3" x 4" card from beautiful decorative or high quality scrapbook paper. Set up the table along with an instruction card and some beautiful pens to entice your guests into leaving their sentiments on the cards that they'll place inside the birdcage. If you are having a small wedding, find a piece of pottery, such as a large platter. Provide a ceramic pen and ask guests to sign. After the wedding, you can simply fire the piece in your own oven, and you have a remarkable keepsake. Another idea is to get a silver platter and have the guests sign it with an engraving pen. This is usable, wonderful, and certainly different. If you are having a larger wedding, making pottery or platters unviable, try an online guestbook. This is convenient for your guests and very quick. It is also manageable for the bride and groom, particularly if there are scores of guests coming. Many times, guests arrive at the reception well before the wedding party. To keep everyone entertained, provide blank quilt squares and fabric pens. Your guests can decorate and sign a square, and these can all be sewn together after the wedding. If you have a crafty friend, her gift to you can be to piece this together for you. There are different ways to incorporate these squares into a beautiful wedding quilt, which will make a great wall-hanging or bed covering. Use this keepsake again and again! Getting people to scrawl their names in a guest book can be difficult, but allowing them to unleash their creativity by doing something different like signing a vase that will be used in your home is a much easier sell – and it’ll be a much more treasured memory. Don't forget to use a porcelain pen so that the names are permanent. Have your guests write their individual greetings or wishes on notecards that can be stored in this lovely wedding wishes guest book that has envelopes for each guest card. Similarly, you could go to a craft store and stock up on some scrapbooking materials. Make these available to your guests at the reception so they can make you a page while they wait for your party or for their meals. This appeals to artistic people, crafty people, and people who don’t like to sit and wait! You can also consider sending your guests the scrapbook page a few weeks before the wedding so they can complete it and give it to you on the big day. What's Your Favorite Guest Book Alternative Idea? Ten Fun Ideas To Choose From! Find even more ideas and step-by-step instructions for creating a unique wedding! More wedding wishing tree pictures and ideas. Ideas for framing and choosing the perfect mat (and pen) to use as a guest book. One of my favorite new trends is the sand ceremony which works well for blended families too. Check out these ideas. Cute ideas for getting that all important ring down the aisle! Tired of the same old wedding ceremony traditions? If so, check out these clever ideas for replacing the traditional flower girl basket. We don't have the guest book here because we write our message on a card we give with the money. These ideas for alternative guest books are all very nice. So would a regular guest book be, to me, since I haven't ever seen one :-). These are all fantastic ideas for alternative guest books. What great choices, I can't even remember the old method of wedding guest records, these are to sweet, great job! I love the wishing well keep sake box, such a treasure. Wow. What a creative collection of ideas. Wonderfully unique, each one! I never knew there were so many different ways to have a guest book! These are so neat, and would probably be a much better way to remember your guests and your wedding than just a book that gets stuck on a bookshelf somewhere! Sometimes couples choose to marry in a private ceremony but they want to celebrate the marriage with family and friends at a reception later on.